Good morning, everyone! I'm so sorry that I've been off the grid for the past week. I got slammed with two major assignments when I returned from my cruise, one of which was a group project. Just to quickly sum that one up, four girls, two who barely paid attention in class (and could not make deadlines), one of whom wrote worse than my twelve-year-old sister, and a TON of editing the end result on my part made for a very unhappy and stressed out Princess Polish. On the other had, for my second project, I finished it on Saturday at 11:30pm... 48 hours before it was due. I didn't do that in four years of undergrad, so I celebrated with a few hours of swatching! 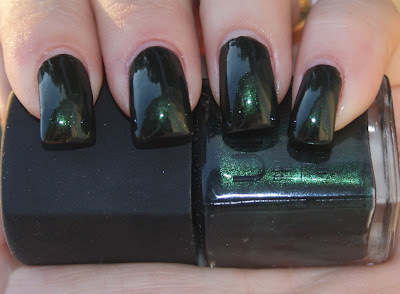 And today, one of those swatches is the subject of my post: Ulta Jaded! Back when this blog was first starting out, I found my very first Ulta, 45 minutes from my house. At the time, there was a clearance sale going on and I snagged Jaded for only $2. I honestly do not know why I waited so long to wear this. A deep, forest green, Ulta Jaded looks nearly black indoors. But hit a flash of light and BOOM! A pop of green microshimmer comes your way! The application of the two coats was like butter with a fairly reasonable dry time. I loved it and used it as a base for a manicure later in the week! Are you ladies feeling this fall color? I own this color as well and only wore it once- this makes me want to wear it more often. I'd forgotten how gorgeous it is!